Any confident handloader would tell you that their creations are just as good as, if not altogether better than, what you would expect to come in a factory fresh box. Can you imagine how good a professional handloader’s offerings might be? 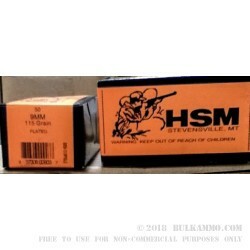 Don’t bother, because you don’t have to thanks to these clean and tidy cartridges by HSM Ammunition. 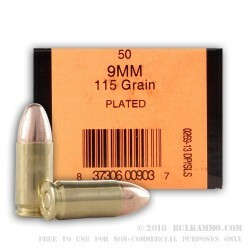 This 9mm cartridge utilizes a reused brass casing, just like new, and sports a 115 grain projectile. 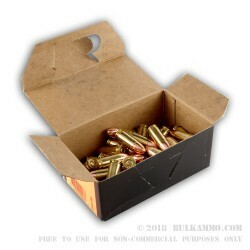 The bullet’s full metal jacket makes this round perfect for long target practice sessions because it prevents the rapid accumulation of lead residue in your bore that would have necessitated frequent cleanings. 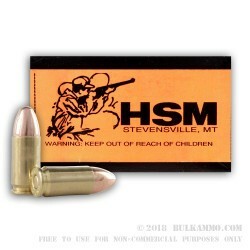 HSM Ammunition is based in Stevensville, MT. They’ve been manufacturing and remanufacturing fine rifle and handgun cartridges since their establishment in 1968, and only use the best components at their disposal to do so.